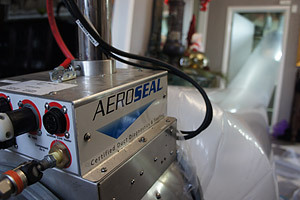 Danforth is an official provider of Aeroseal Duct Sealing Services. This groundbreaking technology allows us to seal any leaks in your air duct from the inside. As the safe polymer is injected into the duct, it begins adhering to the edges of the leak and then compounds together to form the seal. We are able to seal any leaks without dismantling your air ducts, which reduces downtime and labor cost. Leaking air ducts cause stress to your HVAC system. Like contaminant build up, the leaks make your system work harder to maintain a comfortable environment in your building while using more energy. This can lead to shortened equipment life and increased energy bills. Our Team then provides a comprehensive report summarizing the amount of leakage and verifying the success of the Aeroseal process. Start Your Aeroseal Duct Sealing Project with Danforth. Meet with one of our Aeroseal Duct Sealing consultants. We’ll outline our process and begin your project estimate. Fill out an Online Estimate and we’ll reach out to you with a Aeroseal Duct Sealing proposal drafted to your exact specifications. Get answers about our Aeroseal Duct Sealing services and speak with a knowledgeable Aeroseal Duct Sealing Expert.